Some of you may remember the washi tape I purchased at JoAnn's on Small Business Saturday. What I didn't tell you was I knew what I would use these glittery tapes for when I purchased them. 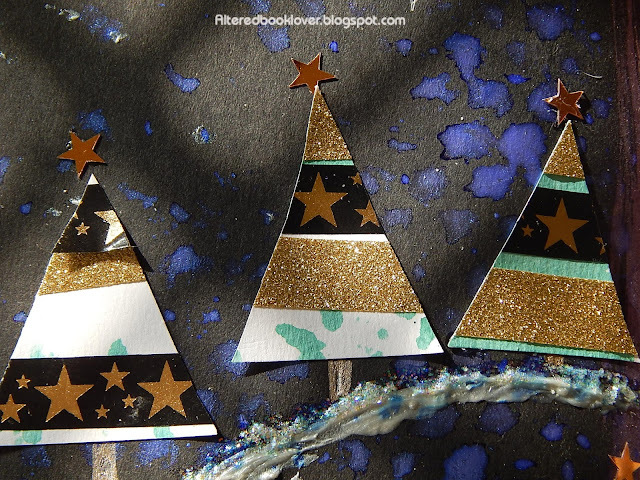 I had a plan all along to make some shiny trees with these gold stars sent to me last year by my friend Valerie. I got out my Stickles pearl paint and my Stickles ice, which is very sparkly, too. 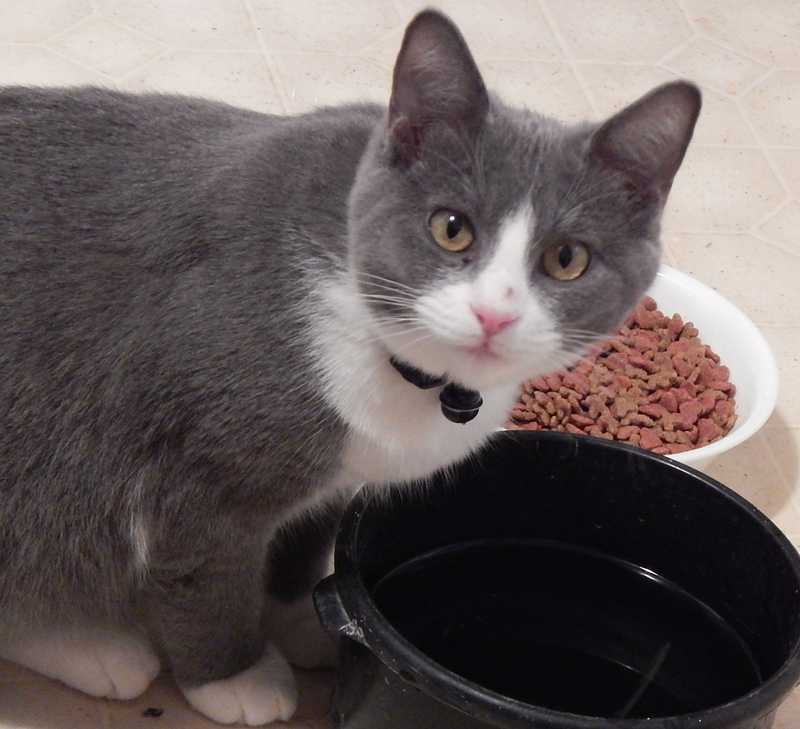 Neither wanted to come out of their little bottles with the tiny holes, so I had to remove them using a bamboo skewer. Not the best choice, but the only one I had. I tried using a toothpick and that took far too long, so I quickly looked for something a bit larger. What I didn't realize at the time was how much the Twinkling H2Os were going to bleed into the Stickles. 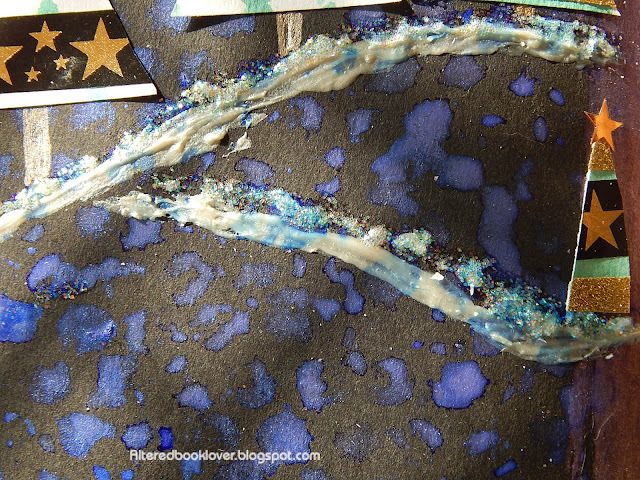 I used both a white Gelly pen and the Stickles pearl on the star in the sky. I used my gold Sakura metallic Gelly Roll pen to create the tree trunks. Since the trees were definitely intended to be Christmas trees, I also sharing them with Moo-Mania & More. 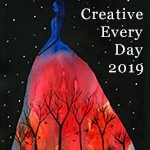 And because I feel like this is cause for celebration, I'm also joining Sheila at Orange Esmeralda, our wonderful host this month at Art Journal Journey with her theme Let's Celebrate. 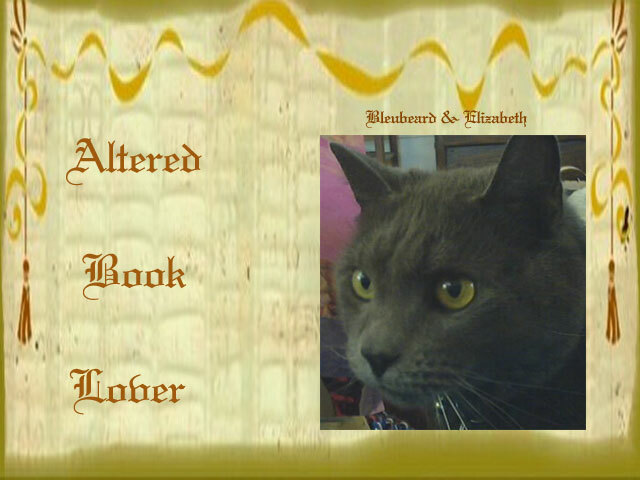 This spread was created in my Challenges altered book. 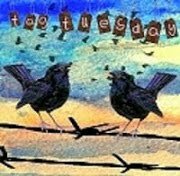 I'm simply thrilled you have joined me today as I created art for Art Journal Journey, Moo-Mania & More, and especially Try it on Tuesday. Maybe I'll see you at each of these places, too. 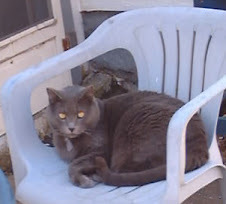 Catching up with your blog again Elizabeth and really enjoyed my visit. Love the page today with the wonderful tree. Wow - this page is extraodinary ELEGANT - I am thrilled about your fancy and elegant trees and such an amount of lovely details! 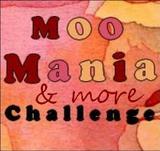 And I am even more thrilled to see this BEAUTIFUL art linked to Art Journal Journey, Moo-Mania & More, and even Try it on Tuesday. You made my Saturday Elizabeth! 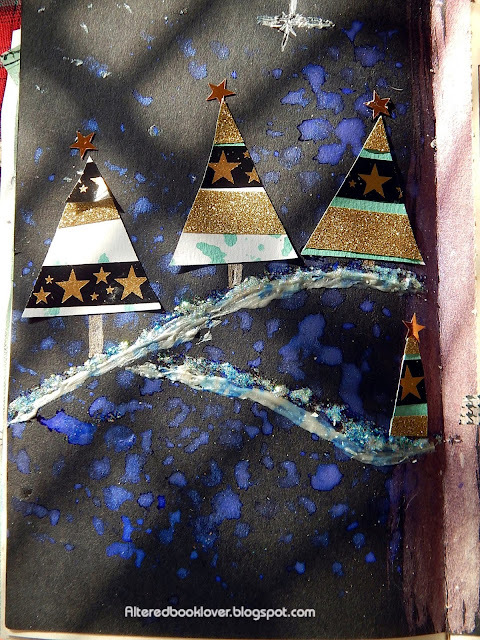 Have a happy weekend and enjoy creating x-mas art furthermore! Lovely page! The trees are wonderful and I’m sure it’s very sparkly in person. I love the trees on this page, Elizabeth. they're wonderful with the different papers and textures. 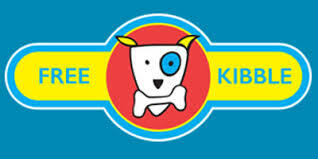 Washi rocks! You know how I feel about Washi tape!!!! I think I'm up to close to 100 rolls of it....LOL! Well, maybe not that much...yet! I made a beautiful addition to your trees. 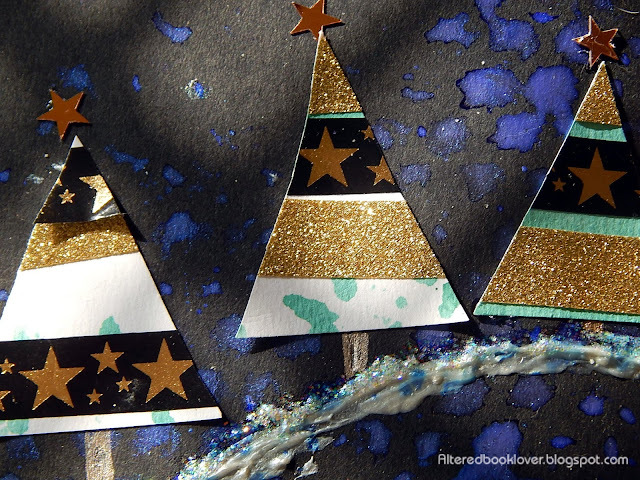 Your glittery trees against the dark sky look great, Elizabeth. I always like to see how other artists use washi tape. We buy these lovely rolls and then wonder how to use them in an interesting way (at least I do) and your washi tape certainly looks good here. 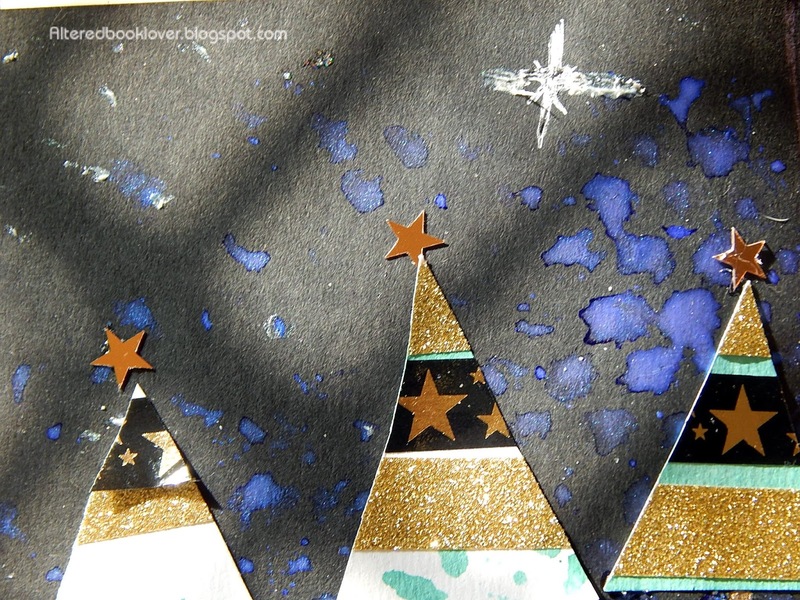 Gold stars and Christmas trees - yes, let's celebrate Christmas! Oh I love this! All those bright blue stars in the background. Hope your weekend is filled with sparkle. I love this- a beautiful, shining festival of trees! 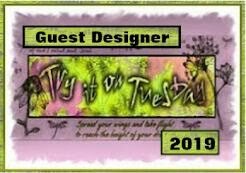 I love these trees Elizabeth, its a fabulous page and I am pleased you joined us over at Try it on Tuesdays. This sparkly Christmas tree scene is so festive :) I enjoy hearing how you put these things together. So beautiful page. Thank you for joining us at TioT. beautiful work on these trees! I always have a hard time with washi tape..taking it off the roll gives me such trouble. You have done such a wonderful job with it..this is gorgeous!